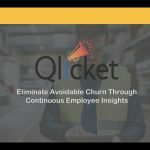 by using continuous employee insights. What does that mean for me, as the Head of HR or as a Warehouse Manager? What questions to ask to gauge employee satisfaction? How to gather the information? How to analyze the data? How to use the employee feedback to actually plan a response to address the issue? How to implement a reaction plan? How to adjust the reaction plan if needed? How to check to confirm the plan corrected the problem? and asking people to pick a smiley face. We offer a full suite service through a combination of artificial intelligence and curated client success expert strategy and guidance.